Melt 2 Tbsp butter in a large pot or Dutch oven over medium heat. Add potatoes, onion, and carrots and sauté until softened, about 8 minutes. Stir in thyme, rosemary, and parsley and transfer to a bowl. Return vegetables to the pot with the beef and stir in 3 Tbsp flour. Cook 2 minutes stirring constantly. Add sherry if using and green peas. 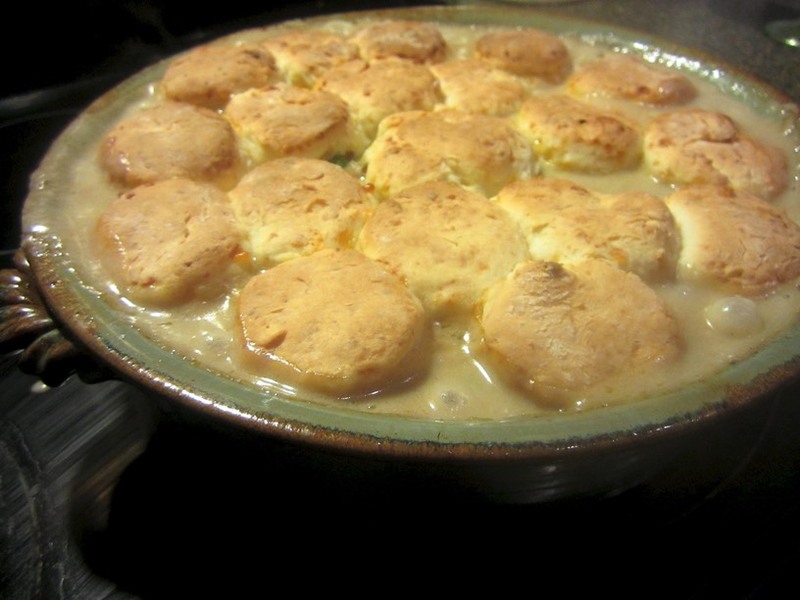 Put meat mixture in a 9 x 13 or similar size casserole, deep enough to hold meat and biscuits. Make Biscuits: I use my food processor, but it is quite easy to do this by hand in a bowl. Blend flour, butter, and cheese to combine. Add buttermilk and mix to form dough. Roll out dough and cut into biscuits, re-rolling leftover pieces. Place on casserole, pushing into the sauce.